My dad took The Husband and I to see A Christmas With Peter White on Saturday night. There were 8 of us and a great time was had by all! Click on this to get a taste of some of the music while your scrolling through this post ~(The video is cheesy, so don’t bother stopping to watch… I can’t figure out audio only! Because of the blasted budget cuts around here, we weren’t going to venture downtown for anything fun this December. Some years we go to the Nutcracker at the Fox Theater. Sometimes, to the see A Christmas Carol at the Alliance Theater. But this year we had nothing of the sort on our agenda. Then Daddy saved the day! I love my city. The Atlanta sky-line is really pretty at night! The venue, The Ferst Preforming Arts Center at Ga Tech, is beautiful. It was all decked out for Christmas. I brought my camera but there were signs saying not to take pictures inside! I’m a big nervous wreck about breaking rules. The music was awesome. Peter White plays jazz guitar. He had a couple of other jazz musicians with him (Rick Braun and Mindi Abair, who’s singing right now!) They jazzed up some great Christmas music and also played some great smooth jazz! Daddy’s made a Peter White fan outta me and The Husband! After the concert, we went to an Atlanta Landmark…The Varsity. Now, if you aren’t from The ATL and I took you to The Varsity, there’s a large chance you’d look at me like I had 2 heads and ask me why I’m trying to kill you. I think you may need a history with the Varsity to love it…My parents went on dates to the Varsity and growing up they took us downtown to The Varsity on special occasions. So in addition to the yumalicious greasy food…there are family ties! I get really nervous ordering because they yell at you…” What’da ya have? What’da ya have?” And you BETTER know what you want or they’ll ask you to let the next person go while you decide! The Husband does my ordering. He thinks better on his feet than I do! Chili Cheese dog and onion rings and a frosted orange…that’s what I like! Baby sister finishing up a top shelf onion ring! Then we decided to top off our gastronomic suicide with a trip to Krispy Kreme! This place also has childhood memories attached to it. Daddy would pile us into the car for no other reason than to drive the 30 minutes to the Krispy Kreme for hot donuts! 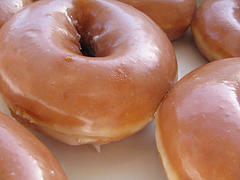 I remember sitting smashed in the back seat of the car, plucking one of those warm,soft donuts from the steamy box. Right to my lips, the airy confection actually started to melt on my tongue before I could take my first bite. I loves me some Krispy Kreme donuts!!! So we got to get a little dressed up and go to into the city for some festive music and greasy food! Oh, it doesn’t get any better than this! I hope you had a good weekend!Did you watch a good movie, eat something sweet, get some shopping done? Do tell! « Let’s Do Dessert Party! Oh how delightful! Christmas and jazz, what a great combination. Would you just look at all the blessings flowing from that budget cut? Amazing photos, I agree , the Atlanta skyline does look beautiful, someday I’ll do more than just drive by or layover there! Would you believe our Kripsy Kreme closed last year? I am drooling over the sight of those doughnuts! The Varsity reminds me of the Soup Nazi on Seinfeld !!! Come over to see what we did this weekend, its written just for you! Between you and Anita, I am starving! Thanks for sharing the warmth and joy and spreading the cheer! LOVING the jazz playing in the background right now… the city skyline is amazing. I can’t even imagine getting to see that whenever I wanted. So beautiful. That looks SO fun. I love the lights. And seeing the food without having to digest all that grease is fan-tastic. 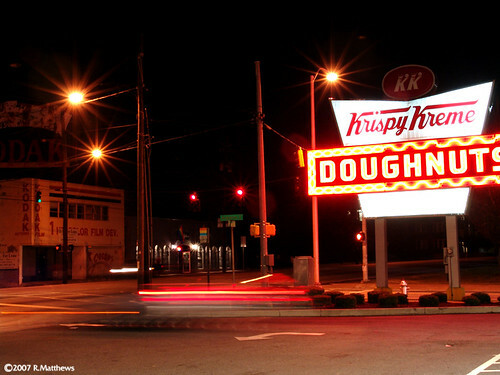 Keith LOVES Krispy Kreme, and when I see an old one I miss the one we frequented when we lived in North Charleston. We have them close to home now, but none like the really old one in SC. Your music reminded me I’m supposed to be sharing favorite country songs with you. For some reason, I am reminded of Trisha Yearwood’s “Mexico.” I have actually been on the rails from So Cal to Mexico and I did not love the feel of the steel against the steel, nor did I love the crying of the rails. I do love the song, though. Thanks so much, Robin….for permitting us to take this sentimental journey with you. There’s kind of a hush, all over the world tonight…. was almost as much fun as being there……….almost. my Ipod, by far the most listened to. Beautiful memories, I remember all the trips into Atlanta..they wouldn’t be complete without a stop at Varsity before, whether it was Sesame Street Live, The Circus, a show at the Fox..always Varsity. And of course KK on Piedmont Rd. Thank you for sharing your evening w/me and your beautiful pic of Atl. skyline. could it be some of my favorite “things” are here?? ATL, PW, K K, the Varsity and YOU!